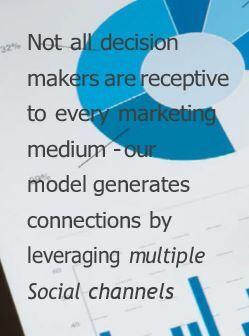 The Social Media audience is comprised of decision-makers and decision-influencers, across a wide variety of markets. By collaborating with us, you can ensure these social buyers find the most up-to-date, relevant information about your products and services in real-time. In addition to our main website, Ailign.com, we leverage many social network content-delivery platforms that help us identify interested buyers and provide content to targeted demographics from lead interest through to client management. A Social post response has a 99% view rate whereas a like has no click through/view rate and a general post has only a 14% view rate. The average social user responds to less than 3% of their contact posts. We believe that connecting with your customers should be as simple as sharing. Unlike other online ad generation services, we do not limit your program’s success by selling you individual marketing methods like SEO, content syndication, AdWords, or influencer banner campaigns. Instead, we work with you to determine the ideal persona for your connections executed thought personal direct social correspondence driven by smart logic to execute targeted social media post responses. ailign is a unique innovative intelligent application that produces timely automated content response generation. ailign consists of pre templated content based on specific trigger keywords/phrases within a primary post. Shared posts on a ailign influencer’s page are searched in real time for keywords prompting an automated response specific to our sponsor branded product/service. Working within ailign as a brand sponsor is simple. Choose the connection level(s) that meet your company’s needs, add response content templates, and leave the rest to our AI.